If white sand beaches and a bit of sun are your cure for winter blues, the Ritz-Carlton Cancun is one of the most luxurious places to try this remedy. In fact, all year round with kids in tow, casual resort wear packed, you can take a trip to where fashion sits by vacationing at the Ritz! For a luxury family beach vacation, look no further than the Ritz-Carlton, Cancun on Mexico’s Yucatan peninsula. Here, opulence is expected and the a la carte service is legendary. Families can choose from any of the 365 guest rooms, including 50 suites (starting at 876 square feet) and 46 Ritz-Carlton Club Level rooms (438 square feet). 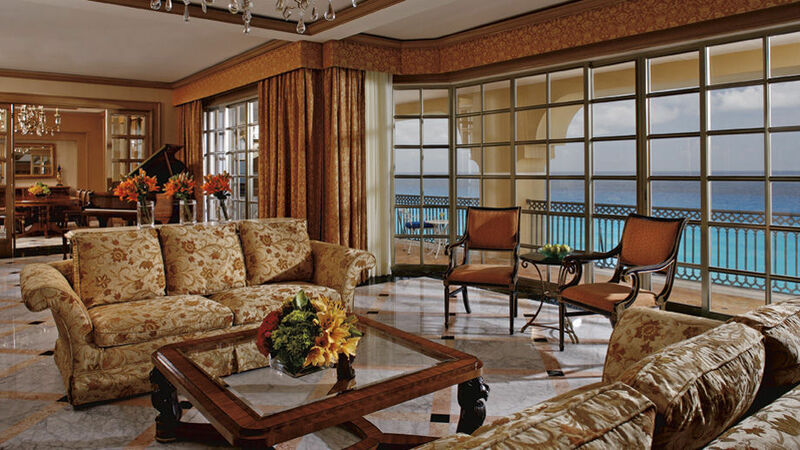 If you decide to book a suite, your family will be getting nothing but the best: the best view of the ocean, a private balcony, and a residential-style living room with a pullout sofabed. Club Level rooms come with extra concierge services and a lounge with breakfast and snacks, which may make the higher rates worthwhile. If that sounds too pricey even for your pampering-hungry clan, consider visiting the resort in summer when there are many family specials on the spacious double rooms. What’s really special about the Ritz-Carlton, Cancun is that they make traveling with a baby simple, allowing Mom and Dad to relax. When booking baby’s first beach vacation, be sure to ask about staying in one of the three Itzy Bitzy Baby Rooms at the Ritz. These specially designed guest rooms include added amenities like a baby’s crib, a changing table, phones that light up instead of ring, and a TV that is specially placed to ensure that your room stays quiet when your baby takes a nap. If you’re still nervous about traveling to Cancun with your child, the Ritz-Carlton also offers a special check-in program for families traveling with kids under 5. With this program, the Ritz will baby-proof your room with a special Protect Our Little Ones kit. Best of all, the package includes a stuffed animal for your most important guest. A stay at the Ritz also includes fun for all ages. The Ritz Kids Mayan Adventures program (ages 4 to 12) offers lots of indoor and outdoor fun, with nature programs and beach games designed just for kids. The prices are reasonable, and families can schedule the Adventure program activities around their stay. Book a full day ($65, including lunch), a half day ($45 without lunch), or schedule an hour of fun ($15 per hour). Just be sure to remember that, in order for children to participate, they must be signed up for the program by 7 p.m. the night before the program. New parents deserve some alone time in the evening and the Ritz-Carlton, Cancun can arrange for pre-screened babysitters on request. Addtionally, they offer a great Kids Night Out program every Friday and Saturday evening for ages 4+. No need to feel guilty about that just-for-mom spa appointment or that romantic meal for two and not three. The program runs from 6pm-10pm and includes dinner at El Café Mexicano, Safari Night or a bubble party, arts and crafts, as well as other indoor and outdoor games. Remember, though, the Kids Night Out program has to be booked 24 hours in advance. How are you going to spend your Parents Night Out? A great meal prepared by a noted chef is always a good option, especially at the Ritz. Be sure to try the Dine with the Chef program where Chef Roy Dunaway invites guests into the kitchen to dine at the 12-seat chef’s table. Here, for $125 per person, guests will enjoy a five-course customized gourmet meal right in the heart of the kitchen, and maybe pick up tips on how to cook better back home. Other date-night ideas include group culinary sessions where guests learn to prepare some of the Ritz’s signature dishes, a tequila tasting (minimum of six people required), a meal at one of the hotel’s eight in-house restaurants, a session at Kayantá Spa, or a day trip to one of Mexico’s most famous sites, Chichen-Itza. If you’re looking for some one-of-a-kind family fun, consider booking your stay between July and November. These months are turtle season at the Ritz, and the hotel makes sure to include all of its guests in this eco-adventure. From July to November, hundreds of sea turtles make their way up onto the hotel’s private beach where they lay their eggs. These classy little additions to the resort are looked after by the Ritz’s Turtle Guardian staff at Turtle Camp for about 60 days. Then the babies hatch and are released back into the ocean. Guests at the Ritz-Carlton, Cancun are invited to volunteer in the local conservation efforts.